Dianne Salerni : Writer of Teen and Middle Grade Fiction | It’s All Good, Right? Today, I have revisions due for a manuscript, and tomorrow my second book releases (although it’s already out in some book stores as seen here). It is also the last four weeks of the school year, and somehow it has managed to become “report card” time again, when I SWEAR I just did report cards. I’m excited about my manuscript and my book and the promise of summer vacation, but right now I notice that excitement and anxiety are very similar. I’m having trouble sleeping, and I burst into tears rather easily. I love, love, love the revisions I’ve made to THE EIGHTH DAY. I’ve fallen in love with this manuscript all over again, but once in awhile (aka, once a day) I have an attack of insecurity and wonder if my editor will feel the same way. I planned a book launch party for THE CAGED GRAVES, but now I’m wondering why I did, because – while I want my book to get lots of attention – I’m nervous when the spotlight falls on me. And since the third trimester of our school year was mostly composed of spring break and 3 weeks of state testing, I don’t know how I’m supposed to have enough new grades to justify a trimester grade. As for this blog, I’m determined that the content will not change into a vehicle for self-promotion during the book launch. I want to keep blogging about the craft of writing, the journey of publication, teaching, and life. So, if I get swamped and can’t produce a post worthy of reading, I’ll just skip. Okay? Anyway, wish me luck on all my stuff. 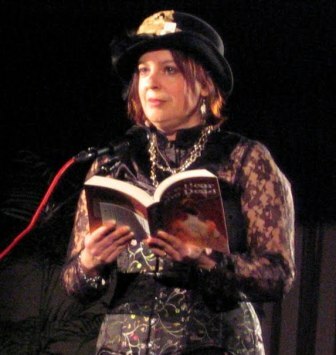 I keep reminding myself that I’ve already done things I never thought I could do: live radio shows and an on-stage reading of my book, dressed in steampunk costume, in front of the strangest audience ever. (Walking up on stage, I actually thought I might pass out from nervousness – although it might have been the corset.) Compared to that, anything the next few weeks might hold must be a cinch. 20 Responses to It’s All Good, Right? You’re such an awesome sauce writer that I *know* your book (this one, the next one AND the one after that) will do well. I’d be nervous too, but you’re lucky you have other experiences where you did it all to draw on. Congrats on your book release! And do what you can here. We understand if you’re too busy right now. Congrats on your book release, Dianne. I can’t believe it’s finally here!!!! No wonder you’re a mess emotions. Who wouldn’t be under these circumstances? 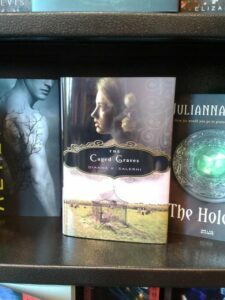 I think you definitely should have a launch party for the Caged Graves! And as for the blog, that’s pretty much how I handle mine, too. When life gets too complicated and I find I don’t have much to say, I just..Don’t. lol. Hold on to the excitement and optimism Dianne! You’re doing great! I think your ideal for your blog during your tour is awesome. To Thine Own Self Be True, right? Love it! So excited for you!!! I gave your book a spot on my blog today, because I had to share the awesomeness! You have so much amazing stuff going on in your life right now, but it’s overwhelming. On a side note, I can relate. Lots of good stuff here on every front, but NO SLEEP for me! What’s up with that?? Hi Dianne – the costume looks such fun – but I can imagine .. and then ‘the strange audience’ .. one day you’ll have to tell us ..
Good luck! I’ve been waiting so long to read Caged Graves. Soooo exciting! I am so excited for your book release! And I must say…” while I want my book to get lots of attention – I’m nervous when the spotlight falls on me.” I TOTALLY get that. I have the same fear. Yaaaay, Dianne, it’s more than good, it’s awesome. I’m so excited about your revisions and The Caged Graves release. You are going to rock the spotlight just by being lovely you. That was incedibly brave!!! 🙂 Love the outfits for steampunk! This time of year is so frenzied – we still have 8 weeks of school left and provincial testing is looming so I feel your pain! Good luck – I bet you juggle it all like a master! Just read your old post about reading to a steampunk crowd. That must have been a hoot! (Especially after your daughter rescued you from yourself.) And if you were wearing that corset properly, I’m sure the experience was also a “cinch”… just like the rest of your writing career is gonna be. Congratulations! That’s awesome you read in costume!!! 🙂 Congratulations on everything. Congrats! I feel that mix of excitement and anxiety every time I near a big deadline or release something big into the public. I find sleep to be one of the best cures! You’re adorable all steampunked! Everything will go just fine – and no worries about the nerves, ’tis all a part of living the dream. CONGRATS on you newest creation. I see SO much is happening! I see you book is available I am ordering a copy as soon as I finish this comment.